How to Cydia download for iOS 9 - 9.0.2 Pangu jailbreak? The Chinese dream team – Pangu, just released untethered jailbreak iOS 9.0 – 9.0.2 solution for users. Thus, using this Pangu jailbreak tool, all iOS 9 users can Cydia download for their iPhone, iPad or iPod Touch devices. So, we like to share all necessary information & guides for our users to get Cydia for iOS 9 devices. This is how to jailbreak iPhone, iPad & iPod with Pangu download for iOS 9. Please Note : This guide is only for the Windows user. For Mac user guide, follow below link.. Please backup your data using iTunes or iCloud. Please update your device with iTunes (Over the air update will cause errors). Also better to disable Anti-Virus program in your PC. How to jailbreak iOS 9 – 9.0.2 using Pangu? Step 02. Right Click on the downloaded “Pangu9_v1.2.0.exe” and select the “Run as Administrator” to launch the application. Step 03. Connect your device to computer via USB cable. Then click on “Start” button. Step 04. Click on “Already Backup” to continue jailbreak. Step 05. Your device will reboot and you will be asked to enable “Airplane Mode”. Step 06. Then, it will be ask you to unlock your device and run the Pangu app. Tap on Pangu app icon in the home screen to proceed. Step 07. Then, tap on the “Accept” button to give permission to access photo library. Then click “OK” to continue. Step 08. Wait patiently & keep your device connected. Once the process is completed, your device will reboot again. Step 09. Congratulations.! you have successfully jailbroken your device. Now you can see the Cydia icon on your home screen. How to get iPhone 6S/6S Plus only Live Photos for older iDevices with Cydia apps? iOS 9 jailbreak update – Pangu tool v1.0.1 released.! 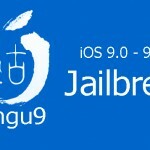 ‹ Pangu 9 jailbreak released for iOS 9.0 – 9.0.2 iPhone, iPad, iPod. Thanks for your info !! My iOS 9 Jailbreak successful with Pangu 9. Cydia working perfectly. Please reboot device and see. If occur again message to us. Excelente pude realizar el JB sin problemas. Some Tweaks may not work properly. Wait until Update Tweaks..
pangu fails at 85% everytime any suggestions? Did you firmware update via OTA? Pangu is not supported OTA updated devices. help!! . sorry for my english. I have a problem and do the JB and the cyia failure. restore and erase all data on my iphone and i can no longer perform again JB an advice? We thought JB not run properly. Did you follow instructions clearly. Please Follow our post. Also better to restore backup and run Pangu 9 as administrator mode. Pangu is not supported for your firmware version – iOS 9.1. Apple has patched Pangu 9 jailbreak with iOS 9.1 update So, if you want to jailbreak & Cydia download your iPhone, downgrade iOS 9.1 to iOS 9.0.2 and then you can use Pangu 9 for jailbreak your device. You have to hurry, Apple could stop signing iOS 9.0.2 at any time causes downgrade is impossible. No, You are unable to install Cydia wihout PC. Live Photo is a feature that comes only with latest iPhone 6S & 6S Plus devices. But, there are Cydia tweaks available to activate Live Photos for older devices like iPhone 4S also. So, you must have to jailbreak your device to get Live Photos. No any alternative method. Why are you afraid to jailbreak for get real features on your device?? Follow instructions are give, you are safe with us..
Why we can’t use version 9.1 on pangu . And what’s the actual time to use pangu on iOS 9.1 . Yes, Pangu 9 is working well. When I touch the button nothing happens why? is it possible to unlock SIM lock after jailbreak? sir do you think pangu 9 will work on ios version 9.2? im useing Windows 7 google chrome and i can’t click start, why is it like that? ios 9.2.1 have cydia ? Cydia is not available for iOS 9.1 & later versions. I have a iPhone 6s Plus mobile version iso 9.3.1 . How can I use split multitasking screen??? Normally, split screen multitasking is originally available with iPad Pro, iPad Mini 4 & iPad Air 2 devices only. But, you can active this feature for your iPhone also with jailbreaking. The Cydia apps like Medussa is doing that job wonderfully for free. Sadly, jailbreak is still not available for iOS 9.2, 9.2.1, 9.3 & 9.3.1. So, you have to wait until jailbreak release for your iOS version to do that.. 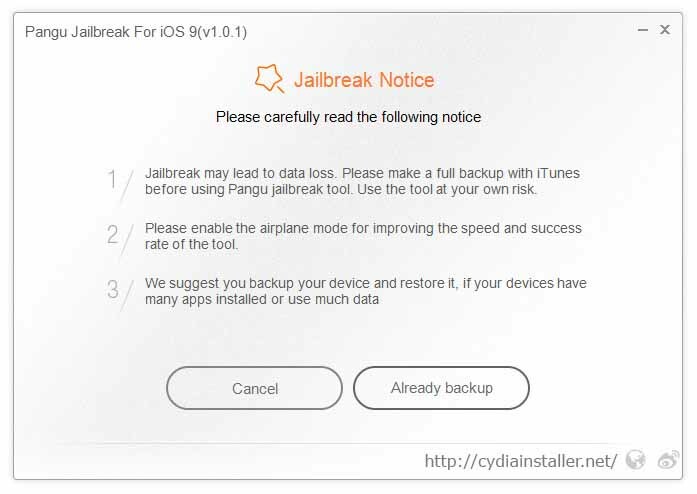 Please follow this – https://cydiainstaller.net/ios-9-1-jailbreak/jailbreak-download-pangu/ , We have given direct download link for users.